Physical Description: 5'10 in height with an average physical build,somewhat lean with a slight muscle build on him from practicing karate through his childhood,short brown hair,brown eyes, Gray zip-up jacket hoodie,with sweat pants and sneakers. Personality:A friendly and somewhat cheerful guy,his emotions are often mixed depending on the situation and his mood. 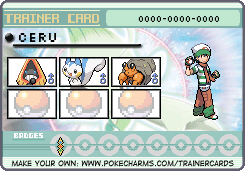 He's usually friendly although a touch competitive a trait shared by his childhood friend Machop. Despite his occasionally awkward manner,he's a trustworthy and helpful young man. History:Zero grew up in a quiet house on the outskirts of the occasionally busy and bustling Mineralpolis City,Although he never became a Pokemon Trainer earlier in his life,this was so he could first complete his school education before setting out. His father was a small business construction worker for the region and as such he kept strong pokemon around with him such as Rock types and Fighting types to help him with his jobs. When his father presented him one day with his very first pokemon, a very energetic Machop,Zero was just plain excited to receive his very own pokemon. He and Machop although never traveled before,were quick friends and have shared a bond ever since. Strategic:Offensive yet strategic enough to think out his plans for maximum damage. Motto:Let's beat down the opposition! You don't have to post here about minor edits, you can just edit it in and link to the profile from your signature (like me!). Egg Pokemon will also start with 3 moves right? If not...then I'll stick with 2. Egg Pokemon start with 2 I think. 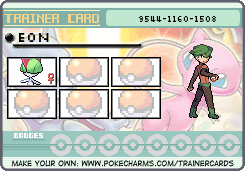 Speaking of which, I have to get a new Trainer Card and edit my profile for the new Egg Pokemon I'm getting. I have a bit of free time today, I might be able to do that before I go to bed.